You can view the top 100 contributors to a repository in the Contributors graph. Merge commits and commits that don't include changes aren't included in this graph. You can view graphs for each contributor below the main graph. 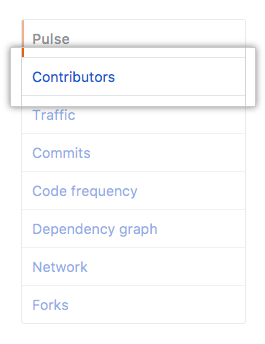 To select a range of time to view contributors and commits, you can click and grab in the main graph. If not already selected, click the Contributors tab. If your GitHub Enterprise username is not appearing in the repository's Contributors graph, it may be because you are not one of the top 100 contributors, you have unmerged commits, or your email address hasn't been added to your GitHub Enterprise account. Tip: To see all commit contributors to a repository, use the GitHub Enterprise API. If you only have commits on an unmerged branch, you will not show up on the graph. To have your commits merged, you can open a pull request. Commits made to the gh-pages branch won't be reflected in the repository's Contributors graph unless gh-pages is the repository's default branch. If you haven't set your commit email address in Git to your GitHub Enterprise account, your commits will not be linked to your account and you will not show up in the Contributors graph.